Yesterday the Church ordained the Rev. 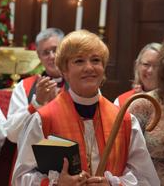 Jennifer Brooke-Davidson the next Bishop Suffragan in our diocese. It was a glorious day. Festive. Holy. Beautiful. Inspiring. More than 750 people praised God, prayed for our new bishop, and celebrated the Eucharist. The Presiding Bishop of the Episcopal Church, the Most Rev. Michael Curry, preached and challenged Jennifer to wake up the church. Twenty-five bishops from across the country and Mexico laid hands on her as we prayed for God to make Jennifer a bishop. And God did. God made Jennifer a bishop. On the one hand it was an extraordinary day, a kingdom of heaven kind of day. On the other hand it was an ordinary day, a kingdom of heaven kind of day. You see, the kingdom of heaven is just another way of describing God’s life in us and our world. It’s already here. It’s already active. It’s not something we have to get. It’s a potential in each of us. We do not bring the kingdom into existence, we awaken to it. We grow into it. We reveal it to the world every time our life, actions, and words are patterned on and grounded in the life, actions, and words of Jesus. Making Jennifer a bishop was the easy part. Now come the harder part. What does all this mean for her? Where will it take her? What joys await her? What challenges will she face? What beauty will she discover? What pain will she endure? What will be asked of her? What will she learn about herself? How will she be grown through this new ministry into God’s dream for her life? I don’t know the answers to those questions and neither does she, but I know this. Those questions are not unique to Jennifer’s life as a new bishop. They are, rather, kingdom of heaven kind of questions that are asked in each of our lives. They are the questions we find at the crossroads of life, in the sleepless nighttime of life, and at times when life is changing. They accompany shattered dreams and dreams come true. They echo throughout the valley of disappointment and they underlie all our major decisions or life events. Given a choice most of us would probably prefer a “what you see is what you get” kind of life and world. We want to look at the world and know what is coming and what will be asked of us. If we ask a question we want to be able to trust that we will get an honest answer, a straight answer. We want to know that if we work hard and do the right thing we will get the result we expect and think we deserve. We don’t want surprises or hidden agendas. We prefer the stability, order, predictability, and control that a “what you see is what you get” kind of world offers. It makes life easier and more manageable. Or at least that’s what we hope and want to believe. The problem is that life doesn’t always work that way. Nor is that, Jesus says, how the kingdom of heaven works. Sometimes real life, kingdom life, is like a net dragged through the sea. It pulls up both the good and the bad. Other times it is like a field that you see day after day. It’s always there. Not much changes. It’s just an ordinary field like any other field except that it is not. Deep within that ordinary dirt is unseen treasure waiting to be discovered. Most of us have lived long enough to know that, despite our desires and hopes, our planning and hard work, we do not always get what we want. The good and the bad, the dirt and the treasure, are never far from each other. Nothing is as it seems. What you see is not always what you get. Look what happened to Jacob in our reading from the Hebrew scriptures (Genesis 29:15-28). He chose Rachel but he woke up with Leah. I suspect that’s happened to all of us. Haven’t there been times in your life when you chose or worked for one thing but you got another? Haven’t there been times when your life seemingly changed overnight? Your life was one thing and now it’s another and you didn’t chose it or want it. That’s when we have to make a decision about our faith and how, or even whether, we will move forward. Do we trust that there is more happening in life than we can see or understand? Can we look at a mustard seed, the smallest of seeds, and see contained within it the greatest of shrubs, a tree in which birds nest? Will we persevere in searching the marketplace of our life trusting that there really is a pearl of great value waiting to be found? Or is our faith limited to what we see here and now, what can be verified by facts and logic, to what fits our desires and expectations? Is what we see now all there is or ever will be? Is this as good as it gets? That’s where Jacob is today. A couple of weeks ago we heard how Jacob bought his older brother’s inheritance for a bowl of soup. 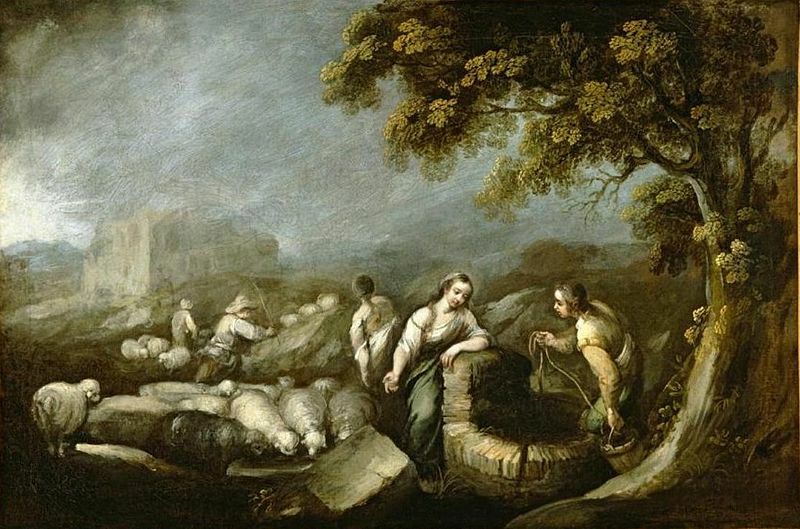 Then he and his mother, Rebekah, deceived Isaac, Jacob’s dad and Rebekah’s husband, into giving Jacob the blessing that rightfully belonged to Jacob’s older brother, Esau. Esau wants to kill his brother and Jacob runs for his life to Laban, Rebekah’s brother. He comes to a well. Laban’s younger daughter, Rachel, shows up. She is beautiful and graceful. Jacob kisses Rachel at the well. Jacob loves Rachel. So he and Laban work a deal. Jacob will serve Laban seven years for the right to marry Rachel. At the end of seven years Laban prepares a great wedding feast. After the wedding Jacob goes to meet his new bride Rachel in the tent to consummate the marriage. “When morning came it was Leah!” Aaahhh!! Laban has done a little bait and switch. He will not allow what happened to Esau to happen to his oldest daughter. It’s not right for the younger daughter to be given in marriage before the firstborn. Laban will not allow Rachel to supplant Leah as Jacob supplanted his older brother, Esau. Jacob, the one who deceived and fled, has now been deceived and trapped. And he’s got to be wondering about that night at Bethel, the ladder reaching to heaven, and God’s promises to keep him and go with him. The wedding night promised one thing. The morning light brought another. Leah is not who Jacob chose, expected, or wanted. That does not sound like the fulfillment of God’s promises. It sounds more like an ancient soap opera. Sometimes, though, things are not as they seem. Who would have ever thought that the soap opera stories of a dysfunctional family, brokenness, lies and deception, betrayal, schemes, unmet expectations and hopes would become our sacred stories? That is not just about Jacob and Esau, Isaac and Rebekah, Laban, Leah, and Rachel. It’s also about every one of us. We each have stories of dysfunctional families and relationships, sorrow, loss, despair, and brokenness; stories of betrayal, lies, and schemes; stories about how we did not get what we expected; stories of how things did not work out for us, sometimes through our own fault and other times simply by chance or the circumstances of life. Those stories are probably not the first place we turn to when we are looking for God. What you see, however, is not always what you get. Like a women mixing yeast in three measures of flour God is always somehow mixed into the stories of our life, regardless of what those stories are or how they came about. You can’t see the yeast or separate it out but it is there, working, leavening, and transforming the flour into something new and alive. Something that feeds our hunger and nourishes our life. Even when we choose Rachel and we get Leah the yeast of God’s life, the yeast of God’s love, the yeast of God’s presence, the yeast of God’s healing is working within us to transform and make new our lives. The leavening power of God’s life is present and active in the life of Bishop Jennifer this very moment even as it is present and active in each of our lives. It makes no difference whether you see it, understand, or believe it. It is already there. The leavening power of God within us can do more than we can ask or imagine. What we see is not all we get. Hear, then, another parable. The kingdom of heaven is like a man who chose Rachel, the younger daughter, the beautiful and graceful one, to be his wife but after the wedding he awoke in the morning with Leah, the older daughter. What a wonderful rendition of the lessons and pulling them together into a brilliant sermon. I’m glad I stumbled upon you!! Thank you Sue. I’m also glad you found my blog.